The complete Orders of battle for McDowell's Army commanded by Brigadier General I McDowell, United States Army. Brevet Major (First Lieutenant) & Assistant Adjutant GeneralI McDowell, United States Army, was appointed brigadier general, United States Army, by General Orders No.64, War Department, Adjutant General's Office, Washington, D. C., on 22 August, 1861, dated 14 May, 1861, and was assigned to command the Department of Northeastern Virginia, Headquarters at Arlington House or Lee-Custis Mansion, Fairfax County, Virginia, by General Orders No.26, War Department, Adjutant General's Office, Washington, D. C., on 27 May, 1861. The McDowell's Army, Department of Northeastern Virginia, was organised by General Orders No.13, Headquarters, Department of Northeastern Virginia, Arlington, Alexandria County, Virginia, on 8 July, 1861. Brevet Colonel & Lieutenant Colonel C F Smith, 10th United States Infantry, was assigned to command the Department of Washington, taken from the Department of the East, consisting of the State of Maryland, and the District of Columbia according to its original boundary, Headquarters Washington, D. C., by General Orders No.9, Paragraph I, War Department, Adjutant General's Office, Washington, D. C., on 9 April, 1861, and Inspector General & Colonel J K F Mansfield, United States Army, was assigned to command the Department of Washington, including the District of Columbia, according to its original boundary, Fort Washington and the county adjacent, and the State of Maryland, as far as Bladensburg, inclusive, Headquarters Washington D. C., by General Orders No.12, Paragraph I, War Department, Adjutant General's Office, Washington, D. C., on 27 April, 1861 (See the Department of Washington). 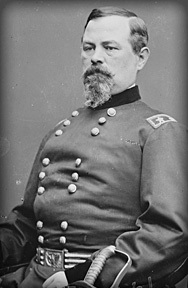 Brigadier General B F Butler, Third Brigade, Second Division, Massachusetts (Volunteer) Militia, was assigned to command the Department of Annapolis, Headquarters at that city, including the country for twenty miles on each side of the railroad from Annapolis to the city of Washington, as far south as Bladensburg, Prince George's County, Maryland, by General Orders No.12, Paragraph II, War Department, Adjutant General's Office, Washington, D. C., on 27 April, 1861, and Major General J A Dix, United States Volunteers, was assigned to command the Department of Maryland, Headquarters, Baltimore City, Maryland, by General Orders No.46, Paragraph II, War Department, Adjutant General's Office, Washington, D. C., on 19 July, 1861 (See the Departments of Annapolis and Maryland). Major General R Patterson, Pennsylvania Volunteers, was assigned to command the Department of Pennsylvania, including that State and the State of Delaware and all of Maryland not embraced in the Department of Washington and the Department of Annapolis, Headquarters at Philadelphia, Pennsylvania, or any other point temporarily occupied by General Orders No.12, Paragraph, III, War Department, Adjutant General's Office, Washington, D. C., on 27 April, 1861 (See the Army of Pennsylvania). Major General R Patterson, Pennsylvania Volunteers, was discharged by General Orders No.46, Paragraph I, War Department, Adjutant General's Office, Washington, D. C., on 19 July, 1861, dated 27 July, 1861, and Major General N P Banks, United States Volunteers, was assigned to command the Army of Pennsylvania and the Department of the Shenandoah, Headquarters in the field, by General Orders No.46, Paragraph II, War Department, Adjutant General's Office, Washington, D. C., on 19 July, 1861. The counties of Washington and Allegheny in Maryland, and such other parts of Virginia that were covered by the Army in its operations were added to the Department of the Shenandoah by General Orders No.47, Paragraph I, War Department, Adjutant General's Office, Washington, D. C., on 25 July, 1861, and the counties of Prince George, Montgomery, and Frederick were added to the Department of Washington and the remainder of Maryland and all Pennsylvania and Delaware constituted the Department of Pennsylvania, Headquarters at Baltimore City, Maryland, by General Orders No.47, War Department, Adjutant General's Office, Washington, D. C., on 25 July, 1861. The counties of Prince George, Montgomery, and Frederick were added to the Department of Washington and the Department of Washington and the Department of Northeastern Virginia constituted a geographical Division, under the command of Major General G B McClellan, United States Army, by General Orders No.47, Paragraph I, War Department, Adjutant General's Office, Washington, D. C., on 25 July, 1861, and he was assigned to command the Army of the Potomac on 20 August, 1861 (See the Department of Washington).